I really need to buckle down and get some work done this weekend. I have a lot of tasks and deadlines coming up and I feel all in a tizzy and very unorganized. So I’m going to sit down, get organized and get things accomplished! I work best when I feel super comfortable and being super comfortable to me means dressing low key. The flannel shirt is the perfect top for that. It keeps you warm if it gets a bit chilly, but the arms can easily be rolled up if it gets a tad hot. 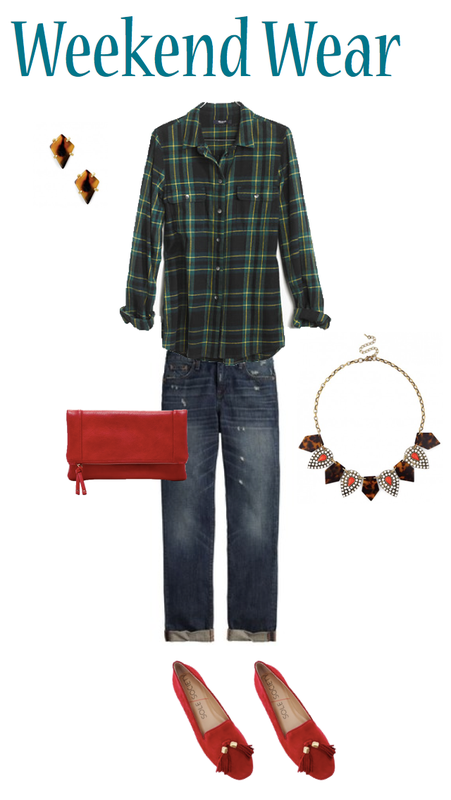 The boyfriend jeans are great for a quick coffee run or for the long working hours typing away on my computer. I always need a pop of color in my outfits and I think the shoes the fold over clutch do a great job of providing that fun bit of brightness. I also love the tortoise shell details on the necklace and earrings as a way to bring out a bit of sass and personality. Got a lot of work of your own to catch up on? Off for a fun weekend jaunt? Share your weekend plans with me in the comments below! I more of a baker than a chef, but when the mood strikes or when I find a recipe on Pinterest that I just have to try, you’ll find me in the kitchen measuring things out like I totally know what I’m doing. 9 times out of 10, I don’t. Cooking for me is all about experimentation and a lot of trial and error. I have to be okay that something I try probably won’t look as good as the picture, but I made it so I’m always a little bit proud. As for inspiration, I love scrolling through pages on Pinterest, but to switch it up, I like to flip through some of my favorite cookbooks. Each is wondrous in their own way and they contain some of absolute favorite recipes. 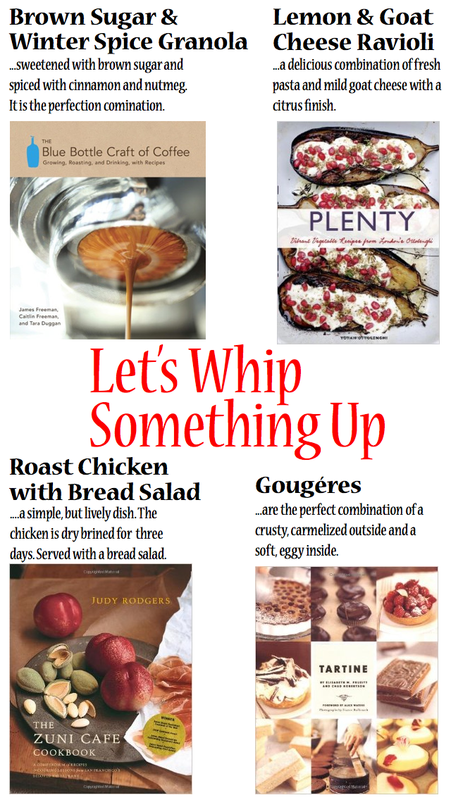 Here are a few of those favorite recipes from my favorite cookbooks. Any favorite cookbooks that I should check out? Share them with me in the comments below! This month, Birchbox did a fun fashion inspired collaboration with Fashionista, a fashion savvy news site. You got the choice of getting the normal birchbox or choosing the curated Fashionista box. Although I knew it would spoil the surprise, I opted for the Fashionista box. It had some great products and a bunch I haven’t tried so it will be fun to test out all these new items. I really loved that they partnered with Fashionista during NYC Fashion Week. It definitely seemed like they packed the box with some Fashion Week essentials! Birchbox Take: This cleansing and conditioning foam is made without parabens or surfactants, so it’s easy on your hair. It’s good to use on all hair types, especially coarse hair, and continues to work even once your hair is clean and soft, adding additional hold and control during styling. My Take: I love the Macadamia line of products. They smell deliciously nutty and make your hair super soft. I haven’t tried this yet, but I heard from another birchbox subscriber to use this sparingly as it is extremely effective and if you use too much, your hair can look a giant poodle. My Take: I got a sample of this in an earlier birchbox and it was definitely a product I didn’t mind getting another of. It has a lovely citrus scent and is the perfect size to throw in my purse to keep moisturized throughout the day when I am out and about. Birchbox Take: This mascara draws on tech from haircare: Its glazing formula softly sculpts and hold lashes in place all day long. The natural cotton fibers in this formula add thickness and length while the bullet-shaped brush carefully coats and curls each lash. Nutrients in the formula leave lashes softer and shinier after use. My Take: I thought that this mascara was good, but not great. It looked really natural on and didn’t clump too much, but it’s still not as amazing as my Dior blackout mascara. However, I do like the consistency and it is the perfect size to throw in my mini makeup bag for end of the day, transitioning from work to play. Birchbox Take: A gentle face mask that draws out dirt and oil like a magnet, clearing blackheads and tightening pores. Proven blemish-busters salicylic and glycol acid work to de-gunk pores, while ejitsu rose tightens them after the fact. My Take: I really enjoy the feeling of this face mask. I’ve only been using it as a spot treatment on my nose area but it seems to be working. I can’t wait to see what it can do in the long term. Bye bye big pores! Birchbox Take: These luxe, creamy liners deliver bold color that lasts and lasts. Choose from five wearable shades: Black, Silver Charcoal, Sky Blue, and Violet. Vegan, cruelty-free, and paraben-free, these liners feature Cynthia Rowley’s signature gold foil design. My Take: This was probably my least favorite product in the box this month. I will say this, it did go on super creamy and delivered a really bold pop of silver. Unfortunately, I’m definitely not a girl who can pull off silver eyeliner. I promise I will find another use for this product. Eyeliner tattoos perhaps? What do you guys think of the Birchbox samples this month? Did you get the Fashionista box too? 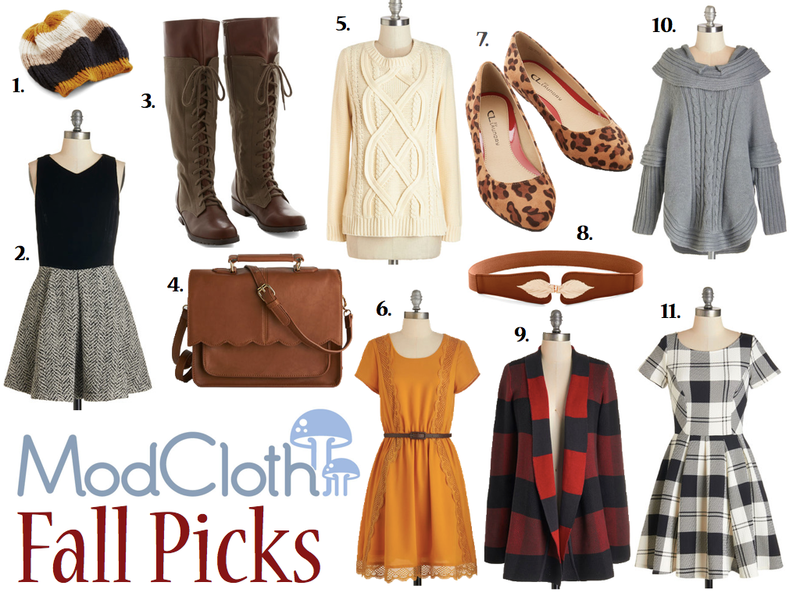 A few months back, I made some Summer purchases on the cutest vintagey site, Modcloth. This purchase included the cutest Air Balloon print dress. Sadly, the dress was a little too tight in the chest for my comfort and needed to be returned. On the upside, Modcloth does a great job with returns and I decided to make my return in the form of Modcloth credit. As I was perusing their new arrivals to pick out something to spend my credit on, I saw a ton of super cute Fall arrivals that I just had to share. Here are some my top contenders! Some days, everything seems to be pulling against you. You trip down the stairs and skin your knee. You’re late for your bus and there isn’t another one coming for 30 minutes. It starts to rain and you didn’t bring an umbrella. Everything you do at work turns out wrong and you feel utterly useless. These are the worst of the worst kind of days, the days that make you just want to curl up in bed and close your eyes until it’s tomorrow. Although, I can’t make it tomorrow whenever I please; sadly I don’t have the time turner from Harry Potter, I have found a few ways to make that bad day a slightly better one. 1. Curl up with your favorite blankie. Don’t lie, most of us have one. Our favorite, most comforting fuzzy little blankie that seems to make everything feel okay. I don’t care if it’s not time to get in bed. Hop right in and cuddle up with your favorite blankie and let yourself feel comforted. Things can only get better after cuddling up with my favorite fuzzy fleece blanket. 2. Phone a Friend. Or your mom, or your boyfriend, girlfriend, sister, brother, dad, etc. You might not want to talk to anybody, your day has just been that bad, but it really is a huge help! A five minute chat with my mom seems to make every issue I’ve ever had seem really minute. She knows exactly what to say and when she tells me that ‘everything is going to be okay’, I truly believe her. A quick chat with another person reminds you that you are not alone in your truly terrible, completely awful, no good, bad day. We have ALL been there. 3. Grab a Donut or your favorite treat. Hey, Hey, Hey, you deserve it! Every once in a while, you deserve a treat and when you’re having a really awful, completely terrible, no good bad day, you deserve an even BIGGER treat. Two of my favorite bad day treats are donuts & macarons. I don’t eat either very often so it always make me feel a bit better to grab an assortment of my favorite treats in delicious flavors. 4. Pick up your favorite book. Sometimes, reading the news or a heavy book is just not something my brain can process. This is only tripled on one of those truly awful, no good, bad days. All I want to do is grab one of my favorite guilty pleasure book series and enjoy some chapters of light reading. And that is exactly what I do. One of my favorites is the Gossip Girl book series. I love diving into the story and remembering all the characters I had forgotten. It does a great job of helping me forget about my bad day, as I read all about Blair Waldorf & Dan Humphrey. If you have a favorite book series that you know is a bit of guilty pleasure, grab it and start reading. No Guilt needed. You deserve to take a brain break! 5. Watch your favorite guilty pleasure tv show. So, I have a confession. I love abc family’s Young & Hungry. It is my current, ultimate, guilty pleasure show. Generally, I save it to watch by myself, when my boyfriend is in taking a shower. It is such a cute show and I am totally rooting for Gabby and Josh to get together. On my really awful, completely terrible, no good bad days, I throw ‘saving episodes’ to the wind and watch all the episodes from the beginning. Giggling at all the silly scenes and oohing and ahhing at all the romance seems to do a good job of making me forget my really awful, completely terrible, no good bad day. So, pull up your favorite guilty pleasure show and make a marathon out of it! Have any tips of your own for cheering up a really bad day? Share them with me in the comments below! Working out has a ton of benefits. It keeps you fit, releases ‘feel happy’ endorphins and can do a great job of helping you clear your head when you’re stressed. The only problem with me and working out is the issue of motivation. It can be really hard for me to get motivated to get up everyday and get dressed to go for a early morning jog or a late evening trip to the gym. It just always seems like I have a million other things to do and I can be so exhausted after a long day at work that going to the gym or for a jog is the last thing I ever want to do. However, a big workout incentive for me is the chance for me to wear some of my super cute workout gear! The only time I really get to show off these cute clothing items is when I’m out for a jog or hitting the gym so it’s the perfect incentive. 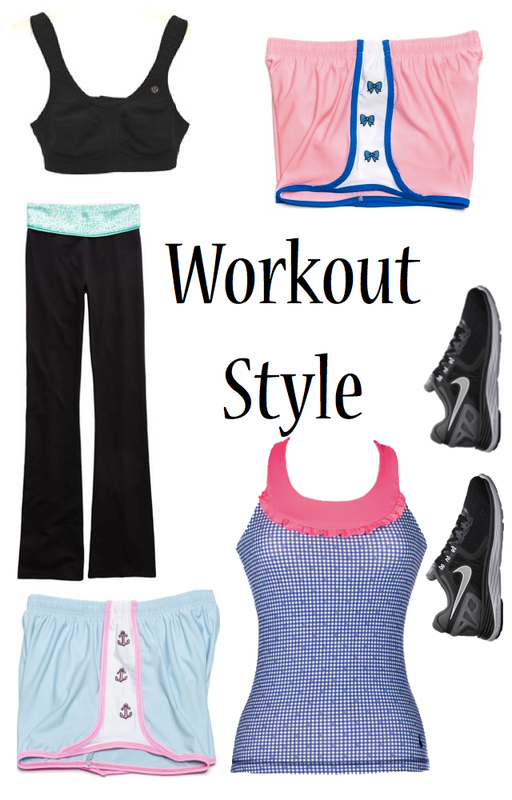 Here are some of my favorites for working out in style. Boots, Boots, Boots! I’m so excited for Fall because Fall means comfy sweaters, cute jeans and Fall boots. Each year, I’ve grabbed a cheap, but very cute pair of boots, knowing they would only last one season. This year I’ve decided, I’m fed up with one season boots! I’m investing in a good pair of boots that’ll last much longer than one season. Here are some of my top contenders. This weekend, I’m really excited for Brunch. It sounds silly, but It’s one of my absolutely favorite parts of each weekend. I love, love, love picking out a new spot to check out, catching up with my friends, and getting to discover a part of the city. After brunch (always eating way too much deliciousness), I like to walk around exploring the neighborhood. And walking demands comfy shoes and easy-going attire. This outfit is perfect for that. The flats make it oh so comfy and the swishy skirt is a perfect length for hot or cold weather. I especially love the rose gold jewelry from Bauble Bar (hello beautiful monogrammed bracelet, I would like to own you!) and the Kate Spade Grove Court purse, which gives the outfit a great pop of color. Any exciting weekend plans? Share what you are up to in the comments below! My first ever giveaway and I am so excited! I decided a while back that for my first giveaway, I really wanted to create my own Brendy Beauty box. I have been a part of a bunch of subscription boxes in the past and some of my favorites were boxes that had been curated by an individual. It ranged from their favorites to must-haves. I liked that the boxes contained a variety of products and didn’t just focus on beauty or fashion. This giveaway is a curated collection of 6 items focused around a theme of a Pamper evening, which is one of my favorite things to do! Bliss Incredi-Peel – An at home Spa Treatment that creates an ‘overnight facial’ effect. David’s Tea Midsummer Night’s Dream & Tea Sachets – One of my favorite loose leaf teas with sachets so you can have it anywhere. 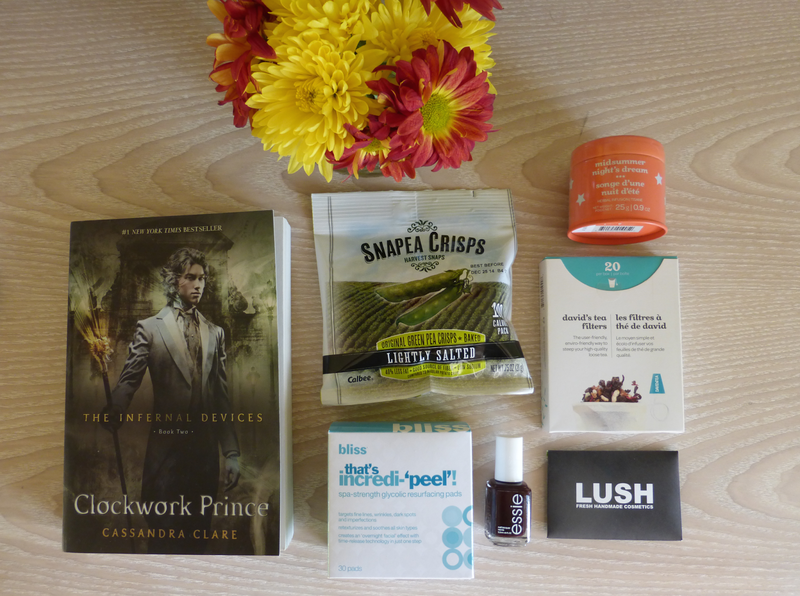 The Infernal Devices: The Clockwork Prince – Every good pamper evening needs a good book and I absolutely love this series. Essie Nail Polish in Wicked – A gorgeous polish and one of my favorites for Fall. Snappea Crisps – One of my favorite healthier snacks. Disclaimer: Because of the super high cost of shipping, this giveaway is only open to U.S. residents. Sorry to any international readers, I promise to expand my giveaways in the future! The giveaway will end on September 26. I have a bit of problem skin. It is both sensitive and acne prone, two things that are usually really hard to deal with when it comes to your skin. Thankfully, I have found some products that do a good job of keeping those problems in check! 1. Liz Earle Cleanse & Polish Hot Cloth Cleanser – I got this in a Birchbox a good long while ago and I didn’t expect it to live up to the hype. Boy, was I wrong. This has to be one of my favorite face washes ever! It smells divine and, in combination with the muslin cloth, it does an amazing job of cleansing my skin. I have sensitive, acne prone skin and I was worried that daily exfoliation might do some damage, but it turns out that it’s the perfect form of daily light exfoliation that keeps my skin fresh and clean. It even does a great job of picking up trace amounts of makeup from the spots of my face that I missed with my makeup wipe. If you have not picked up a bottle of this cleanser, I highly suggest you do so! 2. Algenist Complete Eye Renewal Balm – I got a small sample of this in a goody bag from a Sephora VIB Rouge event a while back. I always find that eye creams are a generally miss for me because I never really see a good amount of difference in my under eye area. I’m too young for serious wrinkles and nothing I’ve tried really helps the slight darkness if I haven’t gotten a good night’s rest or the puffiness that always seems to appear. I was actually pleasantly surprised by this eye balm, as it actually reduced my dark circles by a considerable amount. After couple weeks of use, (love that a tiny container of eye balm can last such a long time!) I found that it did a great job daily of minimizing the puffiness and dark circles associated with a restless night. It’s definitely one of my skincare favorites and something I will be purchasing in a larger size once my little pot runs out. 3. Clinique Dramatically Different Moisturizing Lotion+ – I have gone and come back to this moisturizer a million times and I have found it on my favorites list again for Fall. It always does a great job of balancing out my skin. It does the most important job of moisturizing the dry areas on my face and NOT over-moisturizing my oilier areas. It’s the perfect moisturizer to use between Summer and Fall as the change in the season always wreaks a bit of havoc on my skin. 4. Avène Rètrinal+0.05 Cream – I have only just discovered this product recently through the monthly subscription box, BeautyDNA. I always love seeing what products the smartie beauty product algorithm has picked out for me each month. This product is a Rètrinal cream that is meant to reduce wrinkles and brighten the skin. I don’t have a lot of wrinkles on my face, but I do have two lines on my forehead that always seem to give me a bit of trouble. This product does a wonderful job at diminishing those lines so that now they are barely noticeable. I can’t wait to see what it can do after a couple months of use. 5. Origins Clear Improvement Active Charcoal Mask – This mask is definitely a cult and Brendy Beauty favorite! I always keep a bottle of this mask handy for any day where I feel like my skin is a total mess. It does a great job of decongesting the skin and pulls out all the gunk that has been accumulated in a day of running around the city. This mask has become a necessary component in any Brendy Beauty pamper evening! 6. Origins Checks and Balances Frothy Face Wash – Another Origins product that I just adore is this Frothy Face Wash. When they say it’s a frothy face wash, they MEAN it’s frothy. This product lathers up really well and does a stupendous job of making your skin feel squeaky clean afterward. This, in combination with my Clarisonic, does an amazing job of giving your face a good and proper cleaning. 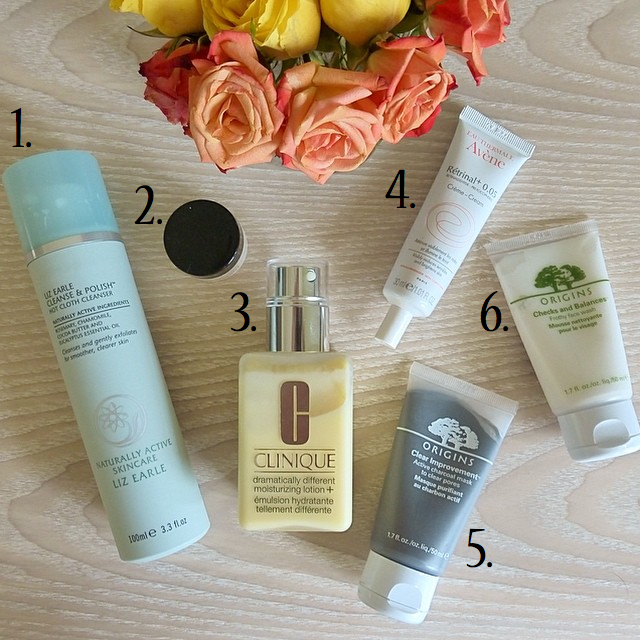 Have any skincare favorites of your own? Share them with me in the comments below!